« Top 5 Spring Skin Tips from the Facialist to the Stars ~ Get That Hollywood Glow Now! As everyone is well aware of, health care in this country is expensive! Health insurance is one of the necessary evils that every family must budget for, but honestly, the costs are getting so out of hand, that this year, my family chose to do something different. Thankfully, my husband has a job which offers full family insurance: health care, dental, prescription and vision. Unfortunately, the costs for even the most basic of plans keeps skyrocketing, while the benefits of each plan are decreasing. This year, my husband and I made a tough decision and cancelled our dental insurance policy altogether. Keep reading to learn more! I reviewed the Family Dental Plan from DentalPlans.com, which retails for $129.95 and up. Sign up today for an annual dental plan and receive 3 MONTHS FREE ~ That's 15 months of coverage for the price of 12! I'm lucky to have a healthy family. Very rarely do we visit a doctor because we are sick and neither my husband or myself have had a cavity since we were young adults. The cheapest dental insurance plan offered by my husband's employer was going to cost us $10 per week. It included free teeth cleanings every six months, but my husband and I usually only get our teeth cleaned once per year. My daughter goes every six months, but four teeth cleanings is hardly worth paying over $500 a year for, so we cancelled our policy. I wish there were a way to receive discounted rates on dental services, but only pay for them AS YOU USE THEM. That's when I discovered the family dental plans from DentalPlans.com. Discount dental plans are not dental insurance policies but dental savings programs instead. Participating dentists have agreed to accept a discounted fee from discount dental plan members as payment-in-full for dental services performed. There are a variety of other key differences between discount dental plans and dental insurance plans. Alternatively, since discount dental plans do not have annual limits, you can use your plan as often as needed. Plus, your plan may even be used to reduce your out-of-pocket dental care costs once you’ve reached the annual maximum on your dental insurance plan. I was offered a family dental plan from DentalPlans.com through CIGNA, which just happens to be the exact same carrier my husband's dental insurance company uses too. I was thrilled with this because we wouldn't even be required to change our regular family dentist. The family dental plan from DentalPlans.com worked perfectly with who we were already seeing. As you can see from the chart above, the CIGNA family dental plan offers substantial savings over having no dental insurance whatsoever. The four annual teeth cleanings that my family undergoes will cost us an additional $128 out of pocket. The dental plan my family received costs $160 per year, which means that we are saving an additional $232 per year by substituting a family dental plan from DentalPlans.com for our traditional dental insurance policy. DentalPlans.com is making quality dental care affordable nationwide. The company connects students, seniors, parents, families and businesses online to compare the best dental savings plans in their area and find one that fits their unique dental care needs. Through DentalPlans.com, people have easy access to savings at the dentist, and an easy-to-use alternative to dental insurance. 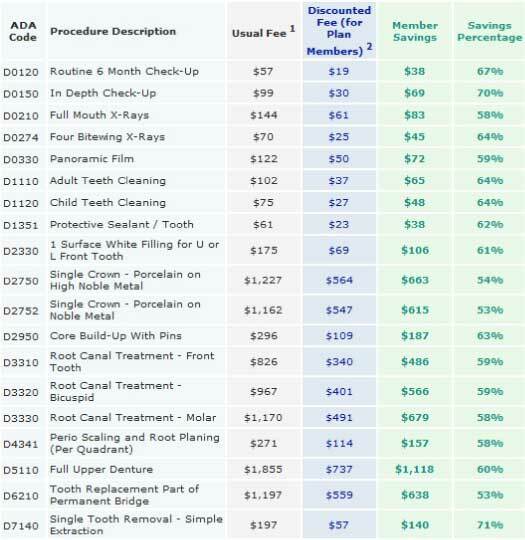 So as you can see, DentalPlans.com can put a substantial amount of money back in your pocket through one of their many discount dental plans. If you're without dental insurance completely or would like to supplement your policy so as to receive continuous savings above and beyond what your dental insurance covers, then by all means, give DentalPlans.com a try! Disclosure: I received the Family Dental Plan from DentalPlans.com in order to facilitate my review. No other compensation was received. This product review is based on my own personal experiences with this item and is completely honest and objective.